Yes a toddler cold sore can happen. The mysterious bump near my son’s eye turned out to be a cold sore and he got it from me, his mom. Here’s our story of how we discovered the cold sore, what we were wrong about and how we continue to treat the virus. Hurt! Eye! Mommy, kiss it. It was the first warm day of the season and we decided to go to the park. As Oscar approached the top of the stairs, he slipped and banged his face on the gate in the doorway. He asked me to kiss it and knowing that the days of kissing boo boos are numbered, I happily obliged without thinking about the healing cold sore on my lip. The idea of a toddler cold sore was not even on my radar. I just wanted my little guy to feel better. There was no mark or any bleeding so we continued on with our outing. When we arrived at the park I saw a little raised bump where he had made contact with the gate. I kissed it again saying OH buddy you really did get hurt. I’m so sorry! 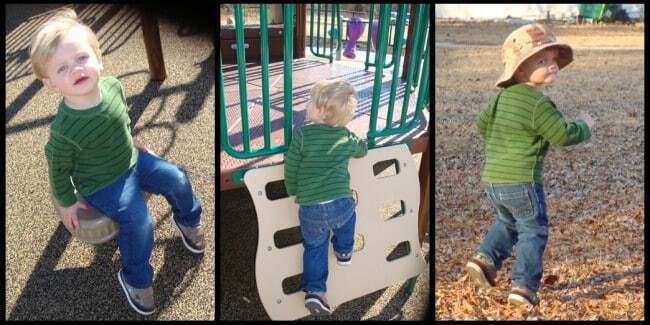 We had a great time playing and climbing and doing what 2 year olds do. We came home for lunch and nap time and that was that. A few days passed and we noticed that his eye was healing very oddly. He developed a minor black eye and a scab formed, which was really strange because he hadn’t even broken the skin. Over the weekend Jerry and I decided that we would get him into the Doctor the next time they were open; which was a Tuesday because of President’s Day. Oscar and I arrived to his appointment and despite his fear of Doctors he did really well. They decided to give him a shot (make that one in each leg) of an antibiotic. They never took a culture or did any testing but wanted to be “aggressive” in case this infection got any closer to his eye. A cold sore near the eye is taken seriously because it has a higher chance of spreading faster and causing some pretty icky vision problems. We were instructed to come back the next day. Wednesday we returned with no improvement to the cold sore and a new spot near the original one that popped up over night. This time, we saw a different Doc in our practice because of the urgency of the matter. She gave us a prescription for Augmentin and Bactroban cream for his infection. We were told that if he had a fever or any oozing to let them know immediately. Through all of this, Oscar was acting completely normal with no loss of appetite, fatigue, fever or lethargy. 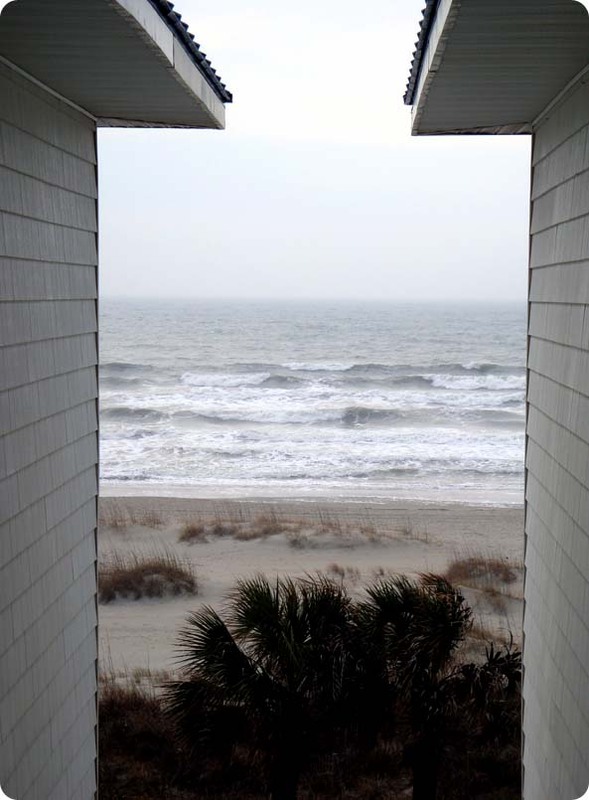 We had planned to go to the beach as a family that weekend as I had won a ticket to a Blogging conference earlier this year. Since it was probably the only conference I would be able to attend this year, I had really been looking forward to it. And besides, a 4 day weekend with my family on the coast after the couple months we have had was JUST what we needed. But because of the eye issue, we decided that I should go to the beach alone and Jerry would stay home with Oscar. Thursday, I left for the conference and Oscar seemed fine, however there still wasn’t any change. Does My Toddler Have a Cold Sore or MRSA? Friday morning, Oscar woke up with two more dots and no improvement so Jerry took him back to the Doctor. This time they finally saw Oscar’s official Pediatrician who took a Bacterial culture and seemed very concerned that nothing had changed. In fact, the issue was getting worse. He finally said the word, MRSA. He told Jerry to go straight to the hospital to start Oscar on IV Antibiotics for 24 hours to knock it out. You don’t want MRSA. He said we did not have the upper hand. I don’t know if you have ever heard a Doctor say that about your child, but nothing about it is ever fun. At 10:15am I got the call to leave the conference and I was in the car by 10:30. I couldn’t believe it. And I couldn’t get home fast enough. Thankfully, the morning rain stopped after a few minutes and most of my drive was clear and breezy. But it was a long 3 hours. I don’t like to feel out of control and boy was I spinning. We spent the night in the hospital in our clothes and while Oscar was enjoying the TV and the attention, there he was with a needle in his arm in a hospital gown. Something I hope I never have to see again. We were scared and upset at our Pediatrician for taking so long to diagnose this horrible thing. But even then, they wouldn’t commit to a diagnosis. 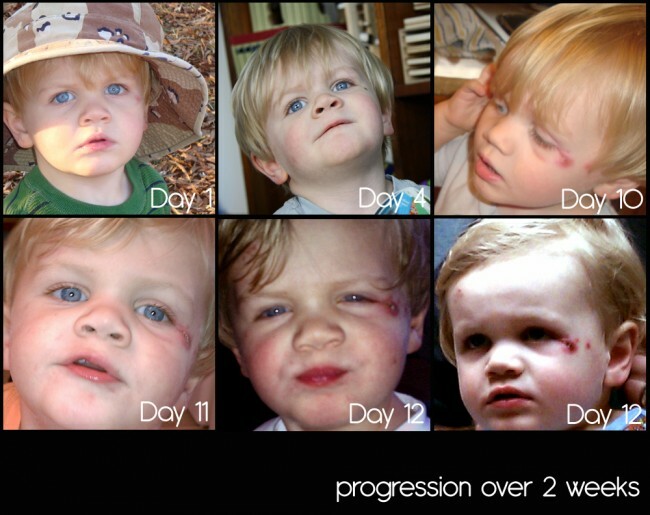 They went back and forth between MRSA and Impetigo, both skin infections with Impetigo being somewhat less serious. We were discharged Saturday morning with a new prescription for the super strong antibiotic and yet, no change to Oscar’s sore. Saturday afternoon, we got a call from the Pediatrician asking how Oscar was doing and how much better it must be. I replied, actually it really doesn’t look much different. Finally he said, you’re kidding me! It should look much much better! He told us to come to his office Sunday morning. After nearly a week, the Doctor decided to do a viral culture and start Oscar on an anti-viral medicine. Somewhere during our phone call on Saturday he mentioned, I wonder if it could possibly be herpetic…. almost not realizing he said it out loud. At that moment everything clicked for me. I have had cold sores on my mouth on and off for my entire life. They are usually caused by too much sun, hormones or stress. Being pregnant and during the stressful weeks we have just endured, I pretty much had a constant cold sore somewhere on my mouth. Hurt, eye! Mommy kiss it…that first day flooded back to memory. It’s a COLD SORE!! We did the culture and scheduled an appointment with the Eye Dr. for Monday morning, a full 2 weeks after he fell. The eye doctor said that Oscar’s sight and sensitivity were fine and we didn’t have anything to worry about, but as shocking as it sounds, he agreed that this was a cold sore outbreak. Tuesday, we got the viral culture back and confirmed what NO one had guessed. My 2-year old never had a bacterial infection. My 2-year old had cold sore. Our little toddler cold sore rocked our world, that’s for sure. Over time, the dots started disappearing and Oscar continued to be his sweet normal self – all but unaware of what took over our lives for 2 weeks. Jerry and I needed some time to recover from what was really the first major parenting challenge. We were sad, confused, angry and unsure of what we could have possibly done differently. I’m proud that we were there for our boy and so SO thankful that it turned out to be something as minor as a toddler cold sore. In the end, we know we did everything we could have and we’re so thankful for our family and friends who prayed for us and walked with us through this strange and horrible time. We know it could have been so much worse and were relieved, but definitely changed. After some time, I learned to show mom guilt the door and just do the best I can. Years later, Oscar has never had another cold sore near his eye but that area gets red whenever he’s really upset about something. He does occasionally get a minor outbreak near or on his mouth and we treat it with a prescription antiviral cream that works wonders. Cold sores can be deadly for babies so it’s extremely important to make sure you aren’t kissing anyone if you have an outbreak. A toddler cold sore was never on my radar, but I know now to ask for bacterial AND viral tests for anything that could go either way. We could have saved so much time, money and heartache if we had started with both tests. We’re just a couple of parents learning as we go, and that’s ok.
What an ordeal! I’m so happy it turned out to be something minor like a cold sore, but g whiz! Wow! I know that was stressful for y’all! I am glad they finally figured it out. It’s still weird having a cold sore by the eye. I get them around my mouth a lot, but never thought that it could happen there! I am so glad for you all that it didn’t turn out to be an infection. Audrey had a febrile seizure at the beginning of last year. She had passed out entirely after the seizure, and I honestly saw her life leave her. I can’t even begin to describe it.It was the worst thing I have ever dealt with in my life. She was taken away via ambulance and hooked up to IV’s for an evening. It was terrifying. The experience shook me to my core. I guess this is just part of being a parent, but it is hard having to feel in control about something so out of your hands, and terrifying. May these be the exception to our parenting days. Sending lots of love to you guys. Wow. What an ordeal. I’m so sorry for all that you guys have been through but so relieved that little Oscar is okay. And I can totally relate to your frustration with the pediatrician; I’ve often felt the same way, especially when it comes to the speed of the diagnosis. You guys should totally plan a mini-vacation for before the baby arrives! We’re taking Small Fry to the beach for a weekend in April — it’ll actually be our first (and last, I guess) vacation with just the 3 of us. Wow! How scary! I’m so glad it turned out to be something so little. I never even knew that you could get cold sores anywhere but your mouth. Wow! I get Cold sores from stress too – I never thought it could go beyond my mouth. I am glad it wasn’t MRSA. Thanks for sharing, it’s definitely something to think about when kissing boo boos! I wouldn’t have thought of that either! how weird! have never heard of that! I used to get them in my mouth all the time, but would have never thought of them near the eye! Glad it’s getting better!! So, I know I commented on this on Twitter, but I just want to toss out a teeny little word of not-a-warning-but-a-pay-attention-just-in-case: I had a cold sore on my eye as a child…except that in my case it was ON my eye….literally… on my cornea (herpetic keratitis). Stress-induced…and I’d had one on my cheek and nose previously. I have no permanent damage, haven’t ever had it again as an adult and don’t really remember it, but I know my mother was told that “wandering” cold sores can end up IN the eye pretty easily. And this was her learning experience: If “pink eye” doesn’t get less pink after about a day of drops, and if kiddo is very, very sobby, take said-kiddo to an opthamologist stat. They’ve got miracle drops that make everything all better. She apparently learned this after about 5 days of pediatricians and even the ER. Not being a mother, I was hesitant to share….and so I hope this less a stress-adding comment and more a “just-in-case-smiles-and-lollipops” comment. You and Oscar are both troopers! 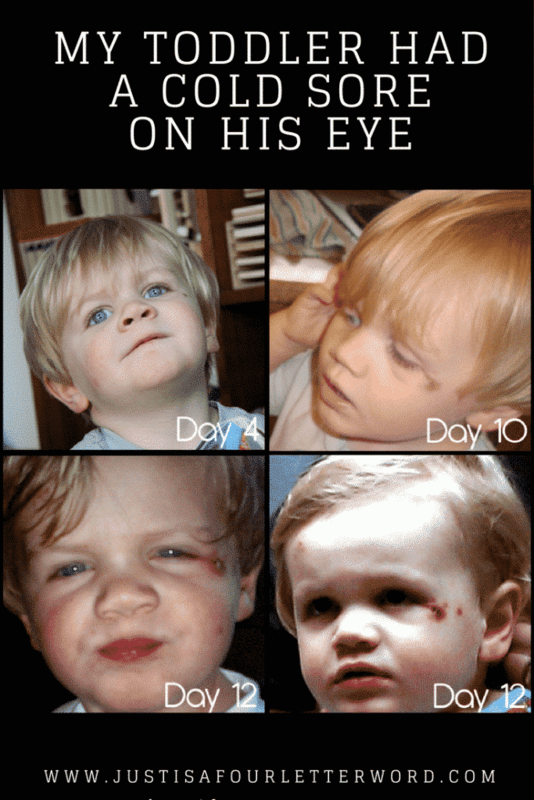 i just took my 2 yr old down to the chemist to get an idea of what is on his face because the doctors are closed on a sunday and i got told it might be the same thing your son had, it’s in the same spot as your son, just beside his eye. i got given an ointment for it but im going to take him to the doctors tomorrow to get a second opinion. i have never had cold sores in my life so i have no idea where he picked it up from. you went through alot but it’s so good to hear your little one’s ok, im glad i came past your story, i now have an idea of what to do.